What becomes a legend most? IMDb editors Melanie McFarland and Mark Englehart talk about the notable films and television shows that have created and chronicled the origin stories of some of our favorite classic and contemporary heroes and heroines. It's probably enough that "Xena: Warrior Princess" executive producers Sam Raimi and Rob Tapert introduced the world to the incomparable Lucy Lawless with this syndicated television swashbuckler. "Xena's" die-hard fans, however, saw something much more profound in Xena's redemption story. The show's writers greatly capitalized on Xena's (and Lawless's) remarkable athleticism, and her ability to best nearly all challengers in hand-to-hand combat. They also had fun expanding her history of being a village girl transformed by vengeance into a warlord before, with the help of Hercules, turning into an agent for the greater good seeking redemption for past crimes. But the beating heart of "Xena: Warrior Princess" was the heroine's relationship with her best friend, the shepherdess-turned-bard Gabrielle. As the series progressed, Xena taught Gabrielle how to defend herself, eventually making her quite a force to be reckoned with on her own. Gabrielle, meanwhile, made sure Xena never lost her morality. 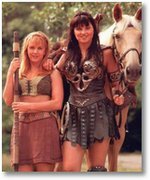 And their bond felt real in the best and worst ways: Xena and Gabrielle turned away from each other, even betrayed one another, over the course of the series. In the end, their friendship was stronger than every obstacle -- including death.